109 Comments As an Amazon Associate I earn from qualifying purchases. 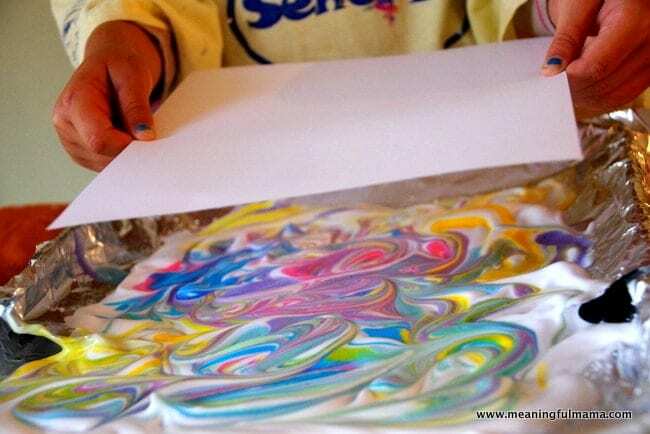 Your kids are going to love making this DIY marbled paper from shaving cream. You know what? It doesn’t even have to be an activity for your kids. This marbled paper would be fun for personal stationary too. We love working with shaving cream as you can see in our shaving cream impressionism paintings, shaving cream bath paints and our homemade shaving cream puffy paints. This is simply one more idea inspired by shaving cream. This marbled paper craft is one I learned was when I was taking my art education class back in college. I have a binder full of ideas, and this is one I pulled out a while ago when we were making our marbled Valentine hearts with shaving cream. The kids had a blast the first time we did it, and I wanted to make the cover for our kids art and activities binder for this school year. You can click back to see how I store my kids’ artwork and schoolwork or scroll down to the bottom for more links. This marbled paper will be a great decorative cover for the binder we are making for this year. How you cover your table is up to you. I used a jelly roll pan lined with foil to house the shaving cream. I used a brown paper bag to lay the paper on afterward and scrape the shaving cream off. I also covered my table in a disposable plastic table cover that I use over and over again for art projects. 1. Choose the colors of food coloring you want to use. I have a variety of gel colors because of my cake decorating, but you can use liquid food coloring as well. I used a muffin tin to sort the colors. I put a bit of color in each one, added water to water it down a bit (about half way full in the tins) and then mixed it with a tooth pick. 2. I lined foil on a jelly roll pan for easy clean up. 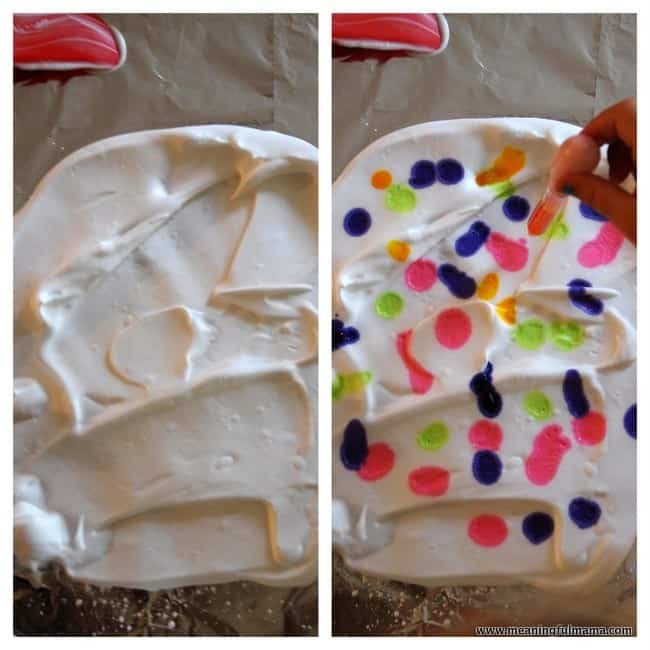 Let kids squirt out shaving cream onto the foil. Spread it out using a spatula. Make the layer about 1/2 inch thick and make it slightly larger than the size of your paper. 3. Using a medicine dropper, make drops of food coloring all over your shaving cream. Have a glass of water next to you, so the kids can clean out the dropper after each color use. 4. 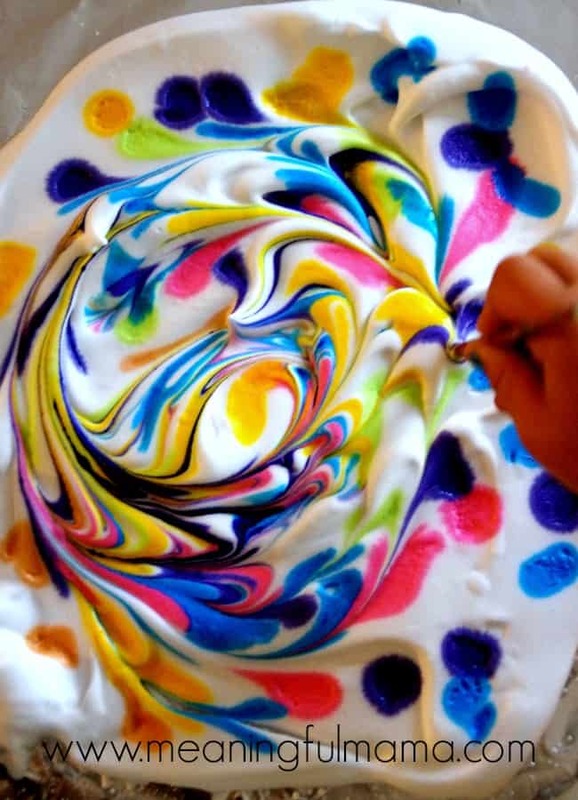 Using a paint brush, kids can start twirling paint until desired swirl pattern. You want to encourage them not to over-mix, which will blend all the colors rather than having a nice swirl pattern. 5. Lay the paper down on the swirled shaving cream. Lightly press onto the shaving cream, making sure all the edges and corners are being exposed to the color. Do not shift the paper, simple press straight down lightly. 6. It is time for the magical moment. You will carefully lift the paper up. Don’t be disappointed. 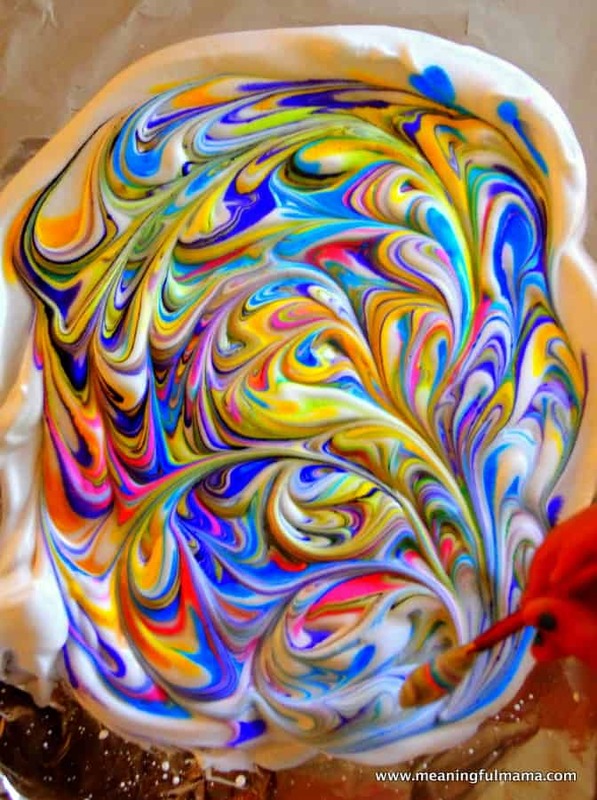 It looks like a mess of colorful shaving cream initially. Using a straight edge (We used a dish scraper), scrape of the shaving cream. Revealed underneath will be gorgeous marbled paper. Allow to dry. Our marbled paper is beautiful and perfect for our art and schoolwork binders. I will add their initials or names with letter stickers. I will add the year as well. I, of course, would love for you to check out my craft or activities tab for more great ideas. I also have some wonderful blogging friends who have put together some e-books and printed books that can be another great resource to inspire creative activities with your kids. Weekly Activity Plans by Hands on As We Grow – There are four eBooks of 5 weekly plans of activities each that are perfect for ages one through preschoolers. Fun ways to get the kids moving, work on fine motor, do arts and craft projects and have fun as a family! Each weekly plan includes a handy supply list and activities broken down to know exactly what to do in a simple sentence or two. Get your weekly activity plans here. 101 Activites tant are the Bestest, Funnest Ever by Holly Homer- Whether your kid is 3, 5 or 12 years old, there are hundreds of fun, educational and engaging things to do in this book. When they ask to watch television, you’ll have the perfect solution. 150+ Screen Free Activities for Kids by Asia Citro – With the one-of-a-kind projects in 150+ Screen-Free Activities for Kids, your family will rediscover the spirit of imaginative play! These fun activities help develop your child’s creativity and skills–all without a screen in sight. 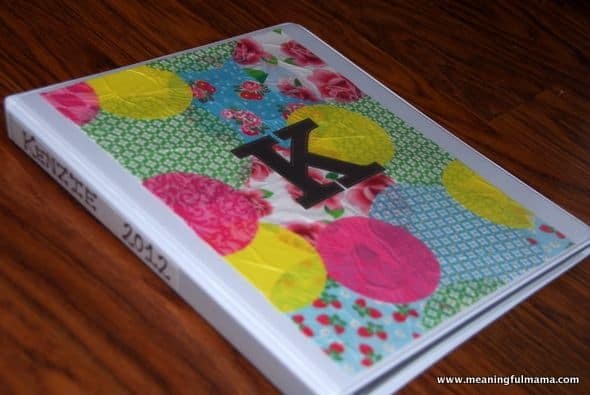 If you are curious how we store our artwork and schoolwork and other ways to decorate the front of your art binders, I encourage you to click back on the following posts to see my methods. So beautiful, thanks for the idea. Im so doing this today, my son loves shaving cream (he has some sensory issues) and we do a lot of things with it but never as art. Thanks again!!! So glad to hear you are doing this today. Have a lot of fun with it! Thank you for letting me know. I really love to know when my content is being used! Cool art That is the best i have seen and i am a artist. Thanks so much. I am glad you like it. It is such a fun project to do with kids! Yes, we used card stock. I wasn’t quite sure what term would be most familiar to people. Have a lot of fun with it! Hi I was wondering if this would work on a canvas? Looks absolutely amazing, would love to be able to do it as a gift on a canvas! Hi! Just saw this on pinterest and love it! Question – can you use the shaving cream mixture more than once? I mean, once you lift the first sheet of paper, is it too messed up to use for a second sheet? Thank so much for the great ideas!! I was able to get a couple sheets out of one batch. The first paper definitely turns out cooler, in my opinion. The second one is pretty too, just a bit softer and more muted in color. Have fun with it! Would this work on a canvas, or only on paper? I am not sure, but I imagine it would and would be so cool. If you do it, will you report back? I use heavier card stock paper for this, and it hasn’t been a problem. The scraper is used just to wipe away the top of the paper. You can use a paper towel to wipe away any excess on front or back and then let it dry. It should have too much on the back – just the part that slipped over the sides. I hope you have fun. I want to create a YouTube tutorial to make it all clearer, so be looking out for that. Should work fine. Can also try bleeding tissue paper. Have had my family draw a self portrait in permanent marker then filled a canvas with squares of bleeding tissue paper and water. Looks great! Spectra brand is a good brand for bleeding tissue paper – found at art stores. Tissue paper bought in the gift bag areas is non-bleeding. Thanks so much for your input. Super helpful information. Do you think 4 year olds would be too young for this? Not at all. I’ve done it with my son a few times. You just want to be there helping with every step along the way. I hope you have a lot of fun with it. Can this paper be used in scrapbooking? Or will it bleed onto the photos? 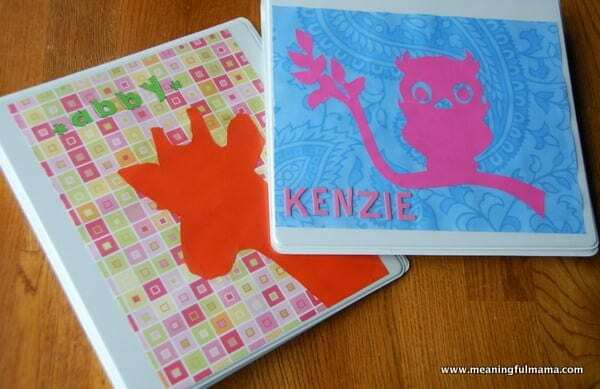 I’m planning to teach scrape booking to my GS troop, and this would be fun paper to create and use in their books. I do not believe it will bleed into the photos, but I have never tried it. I imagine if it got wet, you could run into issues. Other than that, I believe you’d be fine. Have fun with it. After the paper has dried would you be able to put it in the printer and use it? Ooo – I don’t know. I don’t know if I would be comfortable trying it. I just would get paranoid even though the paper seems pretty legit . Let me know if you do try it and whether it works. us oldsters too! I’m going to give it a whirl! Let me know how it goes. It looks like a lot of people are having fun with this project based on the Facebook response. I know it’s a kid project, but it’s absolutely fun as an adult too. It would be great to do for cards or stationary. Have a great time! I think you’ll have a lot of fun. Let me know how it goes. Love this! 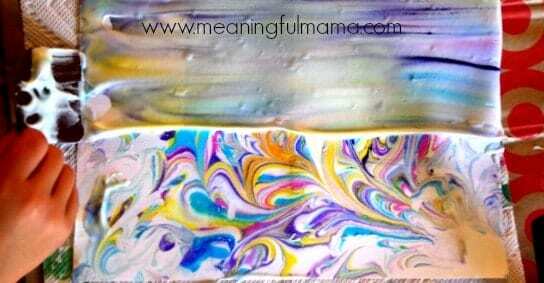 I have always wanted to make marbled paper with my students, but did not like the idea of oil paint. This is perfect! I will be doing this with my students and my summer day camp kids. Thank you! I have to tell you that my students at school made this the other week. It was a BIG hit. Had to share how great they turned out on Facebook. Gave you credit for giving me the idea. Thank you, again! Yay! So glad you had fun with it. Thank you so much for checking back in to let me know! 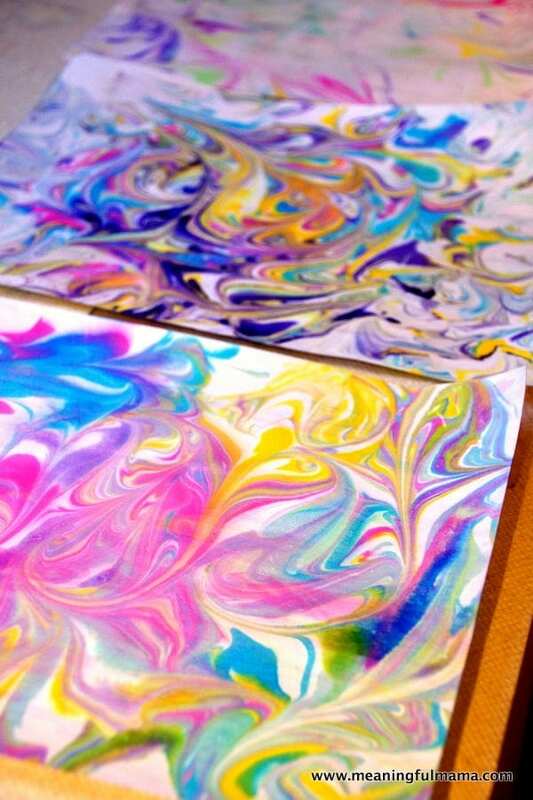 Have you looked up chalk marbling? Scraping chalk across a metal edge of a ruler, swirl with a wooden sewer stick, roll paper on from one side and pick up smoothly. Hang to dry, watch for drips on the floor. Does leave chalk on top of paper so can smudge, fingers will be dirty when picking up clean paper. Use colored papers too. I’ll look it up. That sounds fabulous. Have you tried it with cool whip instead of shaving cream? It would then be edible/nontoxic. No, I haven’t. I have tried to do sticker letters on paper before without much success. I find that it pulls away the the paper it, tearing it away a bit. Maybe I’ve used the wrong stickers. I imagine vinyl letters would be the best. Some people have reported success doing this technique on canvas, and I’m thinking that might work really nicely with the stickers. Will you report back if you do it so that the readers can see your comments and know what works. Have fun with it! This makes me think i might want to try it on canvas with letters for Valentine’s Day or Mother’s Day. Thanks for the inspiration. Great advice for those wanting to do a relief. Thanks so much. Oh yeah. That’s a good idea. I wonder if it would work with a white crayon or something else that would work as a resistance to the color. Let me know how it goes. How long do you leave the card stock on the shaving cream? You don’t leave it on long at all. Just press it into it for maybe 10 seconds and then pull it off. Have fun with this! 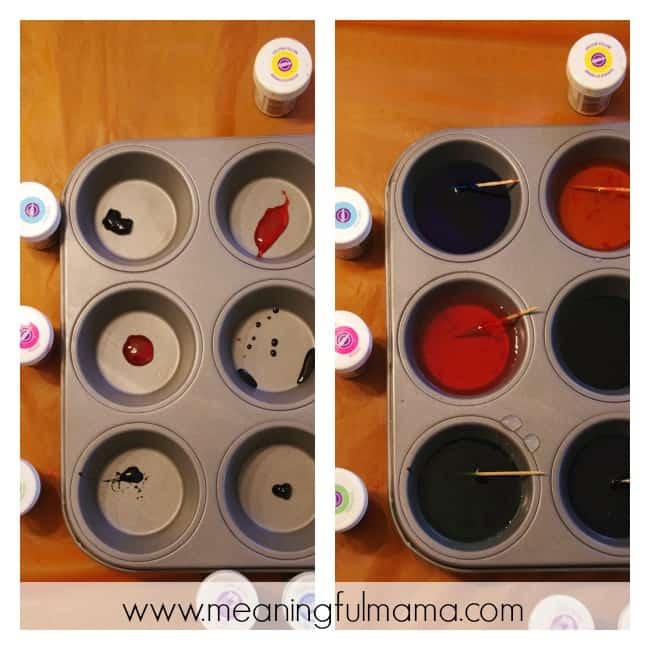 What is the water down colors for in the muffin pans. This is watered down food coloring. I found the muffin tin an easy way to separate the colors. The food coloring mixed with the shaving cream is what dyes the paper underneath. Is that helpful? Let me know if I can help further. Thanks! I love this! I have had a couple people tell me that they’ve done my projects with seniors, and it brings joy to my heart. Thank you for taking time to love and serve them well! I am going to do this with my adult PWS students! They will love the tactile. Am going to change it up to have warm and cool colors on separate papers then use the made papers to create a Jim Dine inspired Heart Art. Rip/cut a heart of either warm or cool colors then place it in the center of the opposite set of colored paper. Makes for great contrast! That sounds perfect. I love your adaptations. There are so many possibilities for different occasions. Have fun. I hope you have a lot of fun with it. I am wondering what is the ratio of “watering down” the food coloring. I see you used gel coloring. If I use regular food coloring, how much is watering down?? 1tsp to 1/2 cup water?? 1 Tbs to 1/2 cup water? There’s not a huge science to it. I don’t think you have to measure. I probably put a couple Tbsp of water into the bottom of the muffin tins. Then I just added a small glob of the gel food coloring. I hope that’s helpful. Thanks so much! I really appreciate you sharing. We’ve done it with paints too. It creates such a fun texture for the kids to work with. I’m so glad you love this idea. Have fun with it. You know, I am not sure. It would be worth a try. Even if it didn’t work out, I think it would be a fun process. If you do try it (and I don’t beat you to it), will you let me know? Have fun! This is so beautiful, the colors are very vibrant. I wanted to try this with regular acrylics, but now I think food coloring would be better. Great stuff! Thank you so much. I think you’ll love it. The food coloring really does work well! Can’t wait to try this with my preschool class today at church, thank you for the detailed instructions! Have so much fun. Let me know how it goes. Hi there! I love this idea. My son and I tried it this morning after finding the tutorial. I am just starting a blog and I am working on a few posts before I publish them and I did a tutorial/review of my own experience following your steps. Do you mind if I supply your the link to this on my post? Hi Bridgette, Thanks for writing. I’m so glad you had fun with this. Congrats on starting a blog. It’s become such a passion for me. I encourage you to provide a link to my post. When I entered into blogging, I wasn’t quite doing it right, so I would love to give you some “best practice” advice to avoid some of the pitfalls I ran into as I was learning the ropes. In blogging, the best thing to do is to not re-write a tutorial. I would re-write a tutorial or add a recipe to my site, thinking that linking back to the original source was enough. I was wrong. I have since learned that the best way to honor the person who originally did the post and came up with the idea or recipe is to link back to their tutorial. You can still add your review, adaptations and pictures of your experience. That is great and encouraged. However, you always want to give your readers reason to go to the original creator’s website. If not, to the original blogger it feels like someone is stealing your work. I hope that makes sense. I did it all wrong at the beginning, and I wish I could have a do-over. I have had to go back and change/edit many of my posts, and I still have some deep in the archives that I need to change. I’d love to be able to save you the work and experience. I’m understanding and assume they aren’t doing it intentionally because of my own errors, but there are other bloggers who get quite annoyed when it feels like someone is “stealing” their content, if that makes sense. I hope that helps as you move on in your pursuits. Let me know if you have any questions about that. Yay! Thanks so much for letting me know. It’s so fun to know that people are engaging with their kids with things I’ve shared. Thank you. How long does this take to dry? I’m thinking about doing this activity for kids at a company picnic and would like them to be dry by the time they leave. Oh man. I’m so sorry I hadn’t responded to this. They dry really quickly. I don’t think you’d have any problems doing this at a picnic. Have fun with it, and I’m so sorry I’m behind on responding to comments. You could have used this information sooner. Wonder what brand of shaving crème you use. I need to find some un-scented!! Can’t seem to find any. I used some old crème (scented) to try this but the house smells like a flower shop! Good job on demonstrating and explanation. You know, I just pick up a shaving cream at the Dollar Store, so I’m sure it was some off brand. I’m not sure what brand would be fragrance free. I’m so sorry I’m not much help. Hey! its an amazing idea. however is there any substitution for food coloring? I haven’t tried anything else. If you try anything, let me know. Liquid Watercolors instead of food coloring. Thanks for sharing this…looks like so much fun…I was just wondering if instead of the paper you could use a small canvas. The report from others is that fabric dye is the best thing if you are working with canvas. I haven’t had anyone directly report back to me. I know some wanted to try paint. If you do give it a go, let me know. You could always try Unicorn Spit on canvas using the same method or without the shaving cream. I had never heard of unicorn spit. I wasn’t sure if you were joking or not. Thank you so much for introducing me to something new. Any specific brand of shaving cream work best? I just bought shaving cream at the Dollar Tree. I’m not sure it really matters. Have fun with it! Have fun! Thanks for letting me know, and stay in touch to let me know your experience! I am a card maker and have made background paper using your method that turned out so pretty! I use photo paper (since I had a lot unused). I am going to teach this to a bunch of senior card-makers on National Card-making Day. Thank you for the instructions. It’s so fun to hear how these are being used. I bet your seniors will have a wonderful time creating this. It’s really the perfect project for all ages. Thanks for reporting that photo paper worked well. Fun! I don’t think regular food coloring needs to be watered down. If you want vibrant colors, water the gel down just enough to make it able to drip into the shaving cream. Have fun! I have used the ink from the bottles you use to re-ink your stamp pads (not watered down) and that works, too. Hi, I am re-doing my 3rd bedroom with lots of bright colors. My grandchildren will be visiting us through out the Summer. I one wall in the bedroom that needs a picture or pictures on it. What I decided to do is let each grandchild make Meme one of these pictures, after they dry I will frame their art work on the wall that needs something on it. Each child will have an opportunity to share their talent with Meme. This is a wonderful idea and thank you for sharing. I’m looking forward to their visits soon. God bless !! I love this idea. I would love to hear how it turned out or see a picture. I’m sure your grandkids had a fun time, and I love to hear from grandparents who are loving and engaging their grandkids in meaningful ways. Thank you for the important role you play in their lives. I would like to go back to the “how long does it take to dry” question asked a while back. I plan to do this during story time and want to schedule it early enough in our time that it will be dry (or very close) by the time they head home. Thanks! Yes! I think they will be perfectly easy to take home at that time. Have fun! I don’t imagine it would work the same way. I wonder if there is a more natural kind of shaving cream that might not be bad. I am there monitoring closely the whole time, and we wash our hands quickly, so I haven’t been too worried about it. Hope that helps. You could try cool whip….but that may be the same as shaving cream…. but you aren’t eating it….. If you do try it, let me know. Great feedback. Thanks so much for weighing in! That is super helpful for concerned parents. I have done this with the slick side of photo paper that you would put through your printer to print photos on. I works fabulously!!! The colors are marbled and glossy then. I had tried this with regular cardstock and then with this photo paper using the exact same procedures before I ever came across your blog. Great Minds Do Think Alike, eh? What a great idea to do that on glossy photo paper. I will definitely need to try that. Thanks for the idea!